Russian Foreign Minister Sergei Lavrov contributed a foreword to the book, calling it a “gold mine” on Mahatma Gandhi’s statement on many issues. 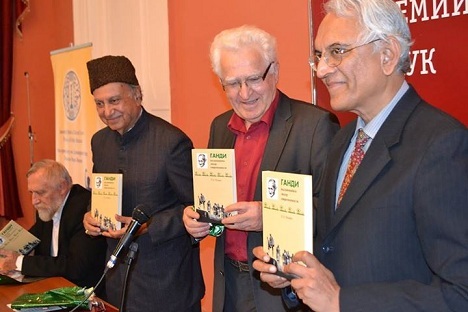 The Russian edition of a book titled 'Gandhi's Outstanding Leadership' authored by retired Indian diplomat Pascal Alan Nazareth was released this week at the Institute of Philosophy of the Russian Academy of Sciences, jointly by Director of the Institute, Academician Abdusalam Guseinov and Ambassador of India to the Russian Federation, P.S.Raghavan. This is the sixth foreign language edition of this widely acclaimed book, which has also been translated into ten Indian languages. The Russian translation was under the editorial supervision of Dr. Marietta Stepanyants, Mahatma Gandhi Chair Professor of Indian Philosophy. Russian Foreign Minister Sergei Lavrov contributed a foreword to the book. In his foreword, Lavrov termed the book a “gold mine” of Mahatma Gandhi’s statements on the widest range of issues, giving the reader an all-encompassing view of his philosophy of nonviolence and its applicability to contemporary national and international issues. He pointed out that the India-USSR Delhi Declaration on “Principles for a Non-Violent and Nuclear Weapon Free world” of 1986, which enunciated a non-violent approach to nuclear disarmament, is proof of Russia’s respect for Gandhian principles. The book explains how Gandhi's Satyagraha can be applied worldwide to bring about major political and social changes. Ambassador Nazareth drew attention to the important contribution of Leo Tolstoy to the development of Mahatma Gandhi’s concept of Ahimsa [non-violence]. P.S. Raghavan expressed appreciation to the Institute of Philosophy, and particularly to Prof. Stepanyants, for the initiative of translation and publication of the book and for actively sustaining the study of Indian philosophy in Russia.